Lines before outlets and children and young people''s majority presence confirm the importance of the 19th Cuban international Book Fair 2010, which will end in this eastern city on Sunday. After being opened in Morro-Cabaña Park in Havana and having travelled eight central and eastern cities, the literary party continues captivating people in Guantanamo, Holguin, Camagüey, Las Tunas and Bayamo province. Conference Center Heredia and stained glass Hall of the Antonio Maceo Grajales Revolution Square are the main venues in Santiago de Cuba, where artistic shows, plastic arts exhibitions, theoretical lectures and book launches are taking place. Meeting between librarian and writer children, Teatro de Relaciones passacaglia, Ballet Santiago performances and homage to culture important figures make the fairground program more enjoyable. Soviet and Russian films are being exhibited in Santiago de Cuba's main movies, where some Russian residents in Cuba are showing craft and other samples of their artistic work. Among literary novelties there are publishing companies like Oriente y Santiago, which have a great significance in the local literary talented people's diffusion. 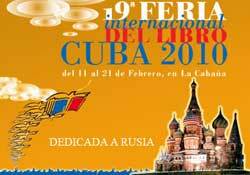 The 19th Cuban international Book Fair 2010 will be closed by the monument of the first Cuban national poet Jose Maria Heredia in Vista Alegre on Sunday.